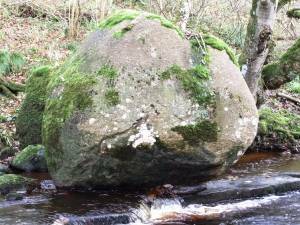 Geology Very large erratic boulder of Shap Granite on the bed of Deepdale Beck, a south bank tributary of the Tees. 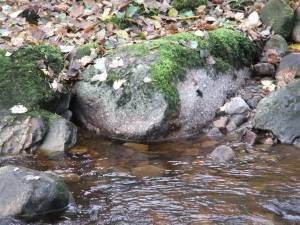 This boulder is much the largest in the area but careful search of the stream bed will reveal several other boulders of both Shap Granite and of Borrowdale Volcanics. 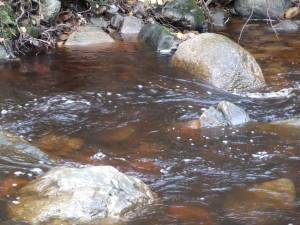 Record Name The Deepdale Shap Erratic, John Phillips and the theory of glaciation. Record Description Very large erratic boulder of Shap Granite on the bed of Deepdale Beck, a south bank tributary of the Tees. 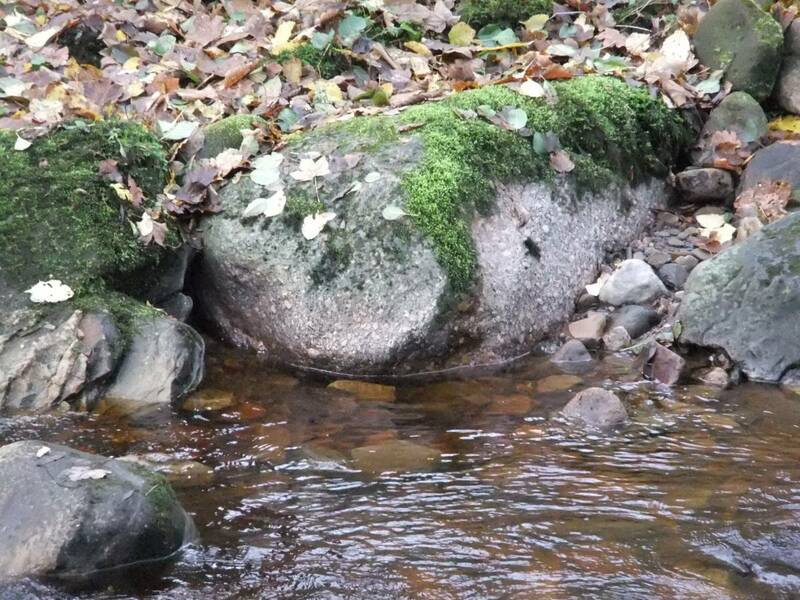 This boulder is the largest in the area but careful search of the bed of Deepdale Beck will reveal several other boulders of both Shap Granite and of Borrowdale Volcanics. 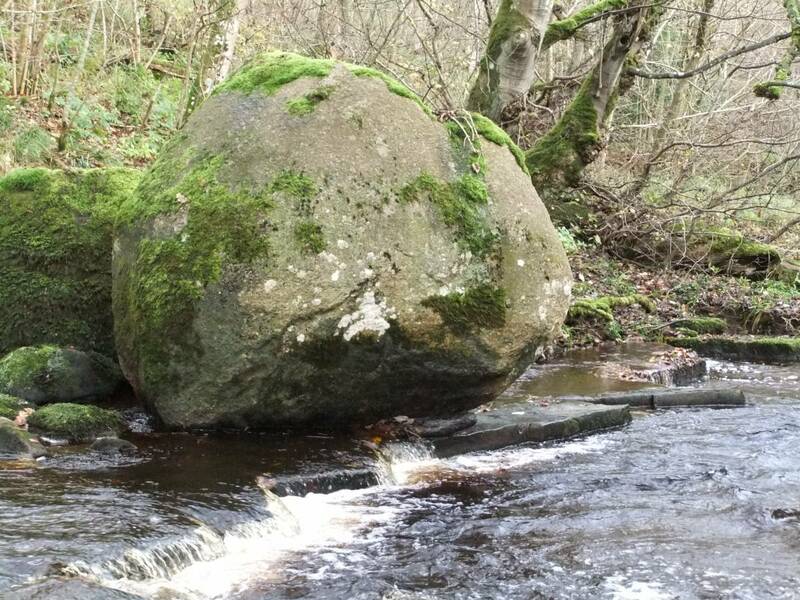 This boulder of Shap Granite was one of the erratics noticed by John Phillips,the pionneering Yorkshire Geologist, who realised that Glacial Ice was the only possible transport of such large boulders and thus contributed to the , then, original and revolutionary idea of Glaciation. For details of John Phillips Life and Works, see .Phillips published his 'Geology of the Mountains, Moorlands and Sea Coast of Yorkshire'. 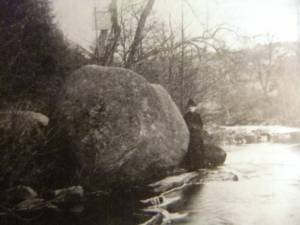 Additional Notes The photographs show not only the well known boulder of Shap Granite but other large erratic boulders in the bed of the stream also. 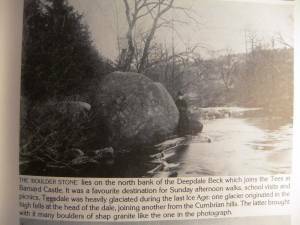 Shap erratic boulders mark the extent of the Stainmore Glacier and are found on the Yorkshire Coast as far south as Robin Hoods Bay and also in the Vale of York. 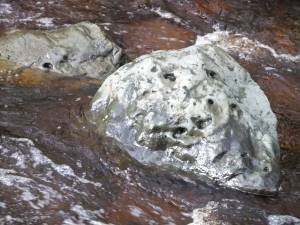 No Lake District erratics are present in Swaledale as the Swaledale Glacier was fed from local snow fields. 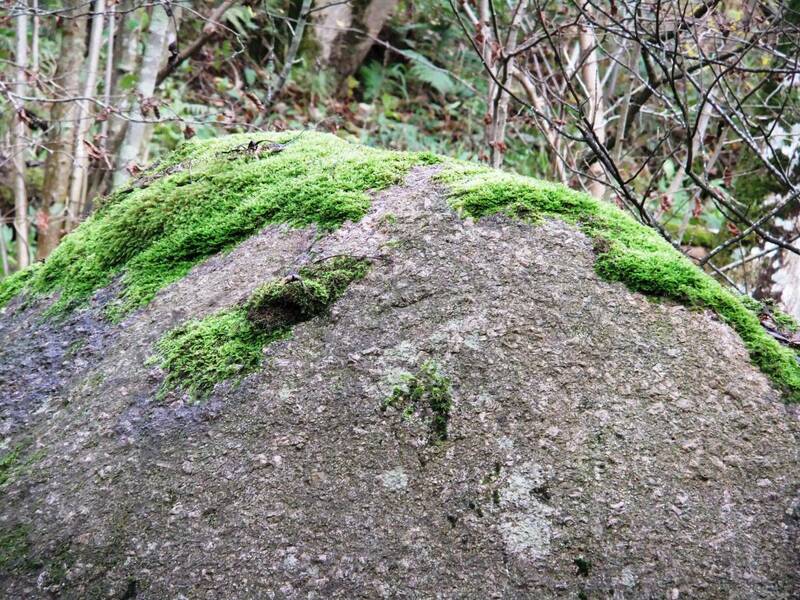 The southern limit of Shap Erratics was considered by Raistrick (Raistrick, A. 1929. 'The glaciation of Wensleydale, Swaledale and adjoining areas.' Proc. Yorshire Geol. Soc.20. 390-410). to be on the line of the south bank of the Greta and Gill Beck. However I have found a number of Shap Granites marking a southern limit of the ice stream carrying Shap Granites some 3km further south: on Barningham Moor, including a single small boulder at an elevation of 430m AOD on Eel Hill at the northern edge of the High Moor, see also SWAAG Record No. Shap and Borrowdale volcanics are widespread in the area of the Stainmore Ice and can be looked for at all exposures of boulder clay. There is a boulder mounted by a public building on North Road, Darlington and a large boulder of Shap granite is perched on the summit of Goldsborough Hill on Ctherstone Moor. Image 3 Description A careful look at the surface of the boulder will identify the large pink rectangular chrystals of Felspar characteristic of Shap Granite. 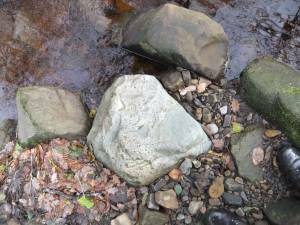 Image 5 Description A second , smaller boulder of Shap Granite in the stream bed. Image 6 Description Boulders of Borrowdale Volcanic Rock also. Image 10 Description The Deepdale Boulder photographed during the later 19C. 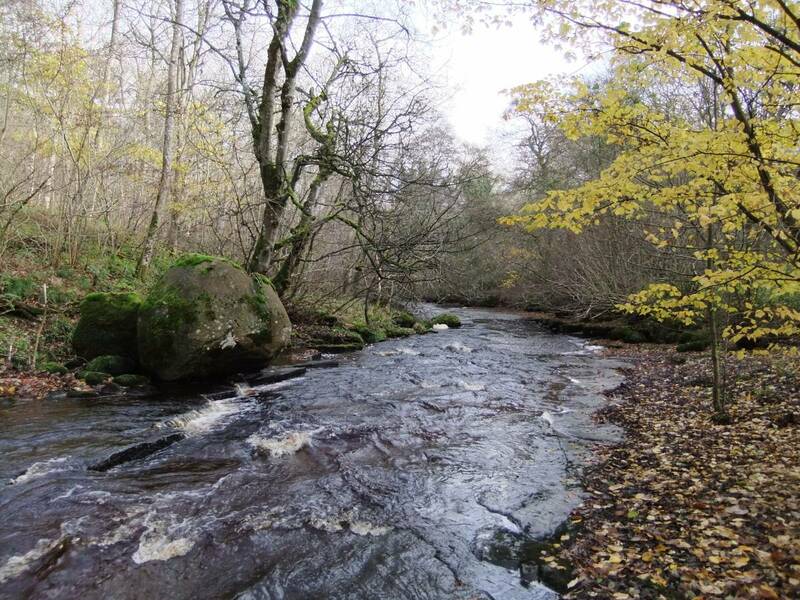 This was the destination for a popular Sunday Afternoon Walk,School and Museum trips.